Welcome to the Marlborough Gardening Association, Wiltshire, UK - one of the town’s most active voluntary organisations with over 150 members. 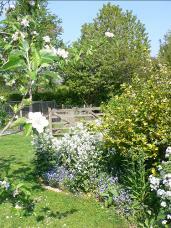 We’re a friendly group of gardeners and horticultural enthusiasts which meets monthly for talks on garden topics at Christchurch Wesley Hall, Oxford Street, Marlborough. We also publish a monthly newsletter and organise events and visits for members. Our annual programme is packed with interest for active and armchair gardeners alike. Each year the Association arranges a series of talks, a lunch, a popular Plant Sale and visits to gardens and nurseries; examples of these can be seen in our Gallery section. New members are always welcome. To join us please complete the Membership Form or come along to a monthly meeting. The annual subscription is £ 7.50. Members receive the monthly newsletter, free entry to the Monthly Gardening Talks, a 10% discount on gardening sundries at T.H. White and special rates on Events and Visits.